US consumer credit showed an impressive increase at the end of last year as Americans went shopping. Consumer credit outstanding, excluding real-estate debt, stood above $3.1 trillion in December, rising in a nearly linear fashion since 2011. Reuters: - U.S. consumer credit in December grew by the most in nearly a year due to a sharp increase in credit card usage, a potentially positive sign for the economy. Total consumer credit rose by $18.8 billion to $3.1 trillion, the Federal Reserve said on Friday. That was the biggest gain since February. But let's put this number in perspective by making a couple of adjustments. 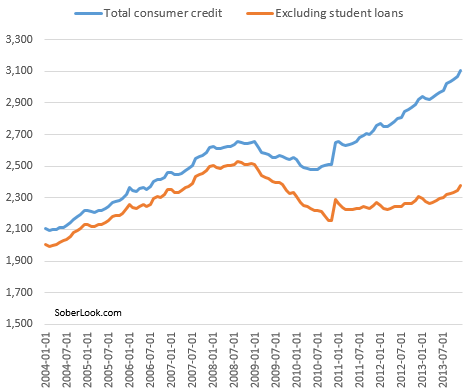 First let's look at consumer credit trend without the government-held student loans. As discussed before, student loans are not market-based and do not represent private sector credit expansion. A very different trend emerges - with non-student-loan consumer credit barely rising until mid 2013. One could argue that student debt is in effect "crowding out" private credit. Even the ex-student loan measure does not tell the whole story. The overall US economy (and the population) has grown since the financial crisis and in order to make a fair comparison one needs look at the trend relative to the nation's GDP. 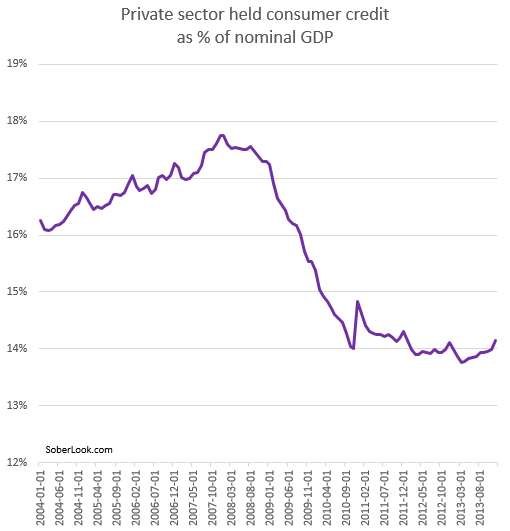 A very different picture emerges - one of significant consumer deleveraging that is only now beginning to stabilize. While the absolute level of consumer credit indeed had a nice pop in December, one needs to look beyond the headline numbers to see the full picture.